Look what showed up at the porch light yesterday! I was taking the puppy out for perhaps the third time since dinner when I spotted this guy hanging on the outside of the storm door. Heaven only knows what it was thinking being out yesterday. While the day was, admittedly, warmer than today was, it still only barely cracked freezing at the afternoon high. By the time I found it clinging to the door it was -3ºC (26ºF) and no moth in its right mind ought to be out at that temperature. Not having been expecting to see any moths for at least another week, and my mothing equipment therefore still all tucked away in the basement, I had to dig through the kitchen catch-all bin (that drawer that every house has that seems to accumulate all the odds and ends) to find a moth jar that had got tossed in there sometime last year. I carefully knocked the moth into it and stuck it in the fridge, which was several degrees warmer than outside, but still sufficiently cool that the moth would remain in torpor. They also just seem to be a lot more cold-tolerant, continuing to be active well below temperatures that would put a larger moth to sleep. 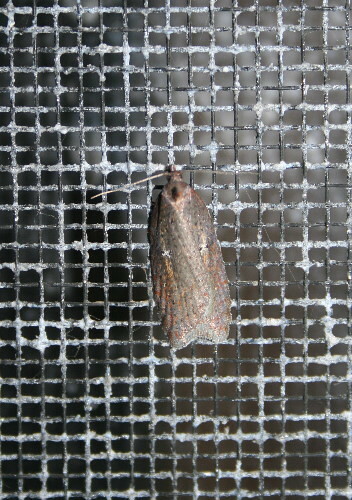 Almost invariably I see micromoths at the porch lights a few nights before the macromoths show up. Still, a February date is a record early for me. Despite a warm couple of days at the end of last week that melted a fair bit of our snow, winter still has us in its grip. And if you’re the sort of person to believe the weather forecast, we’re not likely to see the sort of weather that brings out the moths for at least the next couple of weeks. I took a couple of photos of this guy hoping to put an ID on him, but micros are tricky. 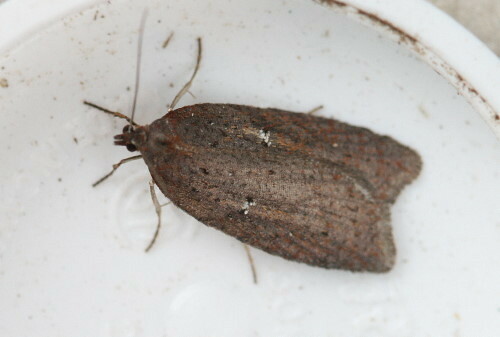 I believe this is a member of the genus Acleris, based on shape, but after browsing MPG and BugGuide, I’ve drawn a blank for a particular species.So many of the species are incredibly variable, and others lack any substantial identifying markings. And some are similar enough or cryptic enough to require examination of the genitalia (under a microscope, using a dead moth since the live ones aren’t likely to cooperate and it requires dissection anyway) in order to determine a definitive ID. I thought those white patches of scales within tan-ish streaks might prove useful, but I didn’t see any good matches. So it goes down as Acleris sp. for now. On the other hand, I’m not too fussy about it. As much as the micro gets me excited, the real first moth of spring will be counted when the first macro turns up at the light. ;) Meanwhile, this guy is still living in my fridge, since the temperature outside is still well below freezing, and at least my fridge is not. I might get a chance to put him back out on Monday. Congrats on the first moth of the season! I’d been hoping it had been a sign of good mothing to come, this early visitor, but seems to have been just the opposite! I was actually looking for a mailing address for Dave Beadle (saw him last night at the Brodie Club meeting) and happened on your blog. Very nice! Thanks, Don! Hope you were able to find Dave’s address (let me know if you didn’t and I can hook you up).